This week-by-week plan, The Harvard Medical School 6-Week Plan for Healthy Eating, will help you transform your eating habits into a program of nutritious and delicious food choices that can last a lifetime. Applying the latest results from nutrition science, Harvard experts take you by the hand and guide you to create an eating plan to improve heart health, longevity, energy, and vitality. Every day, you make dozens of decisions about what to eat. Will you cook at home or eat out? Snack from a vending machine, or carry a healthy snack with you? Making good decisions about what to eat is essential to lasting lifestyle change. And now, putting those choices into practice and eating a healthy diet has never been easier! 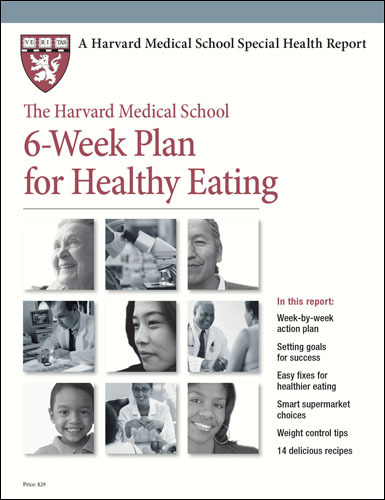 The experts at Harvard Medical School have just published the Special Health Report, The Harvard Medical School 6-Week Plan for Healthy Eating. Week by week, step by step, this report will help you analyze your diet, establish goals for healthy meals and snacks, and incorporate practical changes to make your healthy diet a reality. 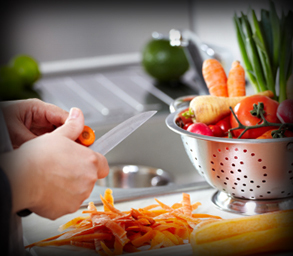 By making just a few dietary changes each week, you can ease your way into a new pattern of healthy eating. Each week builds on the previous steps, and in just six short weeks, you’ll have made an important lifestyle change that can last a lifetime. Special Bonus: 14 recipes for success — delicious and healthy appetizers, entrées, sides, salads, and desserts. We’ll suggest a list of foods you should remove from your pantry or refrigerator, and provide healthy and delicious substitutes. We’ll tell you how to outwit your appetite. How to gauge portion sizes. Which foods to eat at parties, and which ones you should avoid. How to build a better sandwich. What to do if you slip and overindulge. How to strengthen your motivation by rewarding yourself. In just six short weeks, you can revolutionize the way you eat, in small, easy, practical steps. With The Harvard Medical School 6-Week Plan for Healthy Eating, you can make healthy choices from a buffet of possibilities and create an eating plan for life. This week-by-week plan will help you transform your eating habits into a program of nutritious and delicious food choices that can last a lifetime. Using the latest results of nutrition science, Harvard experts take you by the hand as you learn to eat for heart health, longevity, energy, and vitality. Includes recipes, shopping tips, and meal-planning strategies. Take a look at your answers and establish general goals based on your current habits. To set goals successfully, keep the following guidelines in mind. Aim to make just three or four small diet changes in the weeks to follow (one or two goals per week) rather than trying to radically overhaul your eating habits. The gradual approach is a set-up for success because it’s not overwhelming and removes the pressure. Even though you’re setting mini goals, you can often get lots of mileage out of them. By eating out less often or consuming fewer processed foods, for example, you’ll automatically reduce the number of calories you’re taking in, slash your intake of saturated fat, and consume less sodium. Start from where you are now and try to improve. If, according to your food diary, for example, you ate lunch out five times in five days, a good goal to set for yourself would be to cut back to three restaurant or take-in lunches and bring your lunch to work two days. Once you get used to that change, you can add even more days to your bring-lunch-from-home routine, so that eating lunch out eventually becomes the exception. Specific, short-term, behavioral goals are more motivating and easier to measure than general, long-term, end-result goals. Instead of “I want to lose 10 pounds by my birthday,” for example, a specific, behavior-driven goal would be “I’ll have a salad for lunch each day.” Instead of “I’ll stop snacking,” make it your goal to set out a tangerine for your afternoon snack. Behavior-driven goals are easier to achieve because they focus on one step toward a result that can take months to accomplish. Each week, when you reach your behavior-driven goal, you earn an opportunity to celebrate personal achievement, which helps maintain motivation. At the end of each week, assess your progress and reward yourself for the small changes you made; for instance, you might treat yourself to a movie. Moving in the right direction deserves some acknowledgment to encourage you to continue the positive, healthful behavior change. Based on your food diary, what specific goals would you like to set? List three goals for changes you’d like to make in your diet in the coming weeks.